Richard Scarrys Postman Pig and His Busy Neighbors is for Baby to Pre-K. Richard Scarrys Postman Pig and His Busy Neighbors was written by Richard Scarry. Richard Scarrys Postman Pig and His Busy Neighbors was published by Random House Books For Young Readers. 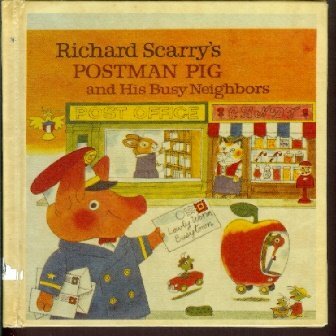 Subjects of Richard Scarrys Postman Pig and His Busy Neighbors include Animals, Children: Preschool, City and town life, City life, Early learning / early learning concepts, Fiction, Non-Classifiable, and Occupations.